For this lesson, we will go over the consonant + vowel sounds that begin with the [h] and [m] sounds. Luckily there is only a single unusual sound that can be found within this group, so it should be fairly easy to learn all of them. This is one of those situations where using English letters really messes things up. When you read that ふ is pronounced like [fu] you naturally make the English [f] sound by slightly biting your lower lip and blowing air out through your teeth. Unfortunately this is a completely wrong way to make the ふ sound in Japanese! Having said that let me give you a basic guide to making this sound which might help you to visualize it. Start by making a [huu] sound, but keep your lips relaxed as you don’t want them to be completely rounded like we would do in English. Then once your mouth is in that position and can blow air out with a [huu] sound, try switching that [h] to an [f] and make the ふ sound. This ought to create just a little bit of wind resistance against the tips of your teeth, and it ought to round the lips just a tad, but not nearly as much as we do in English. Try doing that in combination with listening to the recording of the ふ sound several times. It should get you close enough to where you can hear and then recreate what the native Japanese person is doing. Practice every sound three or more times. Practice the ふ sound six or more times based off the instructions and audio samples in this lesson. Write out each kana five or more times. Practice each word three or more times. 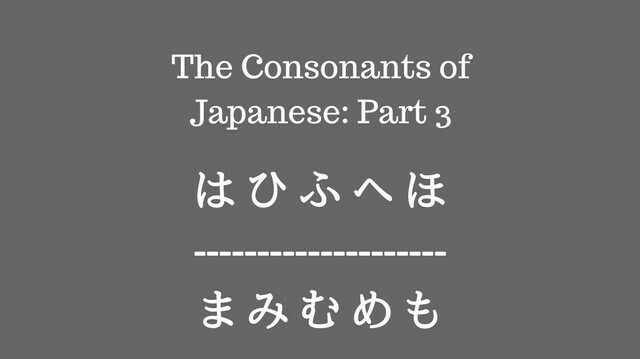 The next part contains a sound that is vital for speaking and understanding Japanese that most English speakers aren’t used to. Go Back to Lesson 5!